There are a variety of sites for field trips ranging from city parks to county forest preserves, as shown on the map to the right. Field trip sites can be found as far north as Lake Forest and as far south as 135th Street. 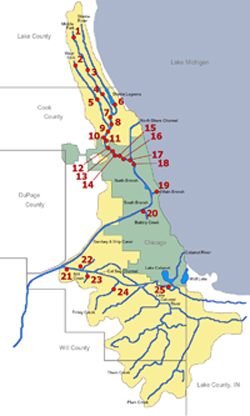 Below is a list of sites arranged from north to south along the Chicago River system. The site numbers correspond to those on the map. Each link will display a PDF with information about directions, access to water, amenities, parking and capacity. Feel free to call or email us for recommendations on other sites not listed here. Download a list of field trip sites with the site names listed below. If your group plans on visiting a sites within the Forest Preserves of Cook County (listed above as sites #4-16 and #21-25), please submit a Forest Preserves Education Permit Request Form as well.